Review: "Borealis: Fall From Grace" - Sea of Tranquility - The Web Destination for Progressive Music! Canada's Borealis have delivered their sophomore release (and first for Lion Music) in the form of the powerful Fall From Grace. Big, chugging guitar riffs, passionate vocals, symphonic keyboards, and pounding rhythms all make up the formula, which is melodic power metal with prog & goth overtones, much like Swedish veterans Evergrey. The shadow & influence of Tom Englund & Co. looms large on the crushing openers "Finest Hour" and "Words I Failed to Say". In fact, guitarist/vocalist Matt Marinelli sounds quite a bit like Englund at times, so much so that I almost had to do a double take and check the album info to make sure the Evergrey frontman wasn't guesting on Fall From Grace. The Evergrey comparisons aside, there's plenty of exciting metal to be found here. The title track has some dramatic arrangements (Kamelot, Symphony X, and Dream Theater fans will love this one! ), and the layers of acoustic guitar, lead work, and massive riffage on "Where We Started" offers up some solid headbanging moments. Toss in some powerful, epic tunes like "Breaking the Curse", "Take You Over", and "Forgotten Forever", each with no shortage of haunting keyboards, tasty guitar work, sledgehammer drum fills, and Marinelli's excellent vocals, and you have a prog/power metal album that is well crafted and impressive from top to bottom. Nice to see a band on Lion Music that puts the songs ahead of the musical flash (not that there's anything wrong with that mind you! ), as Borealis are less about showing us how well they can play (though they certainly can) and more about delivering killer songs. 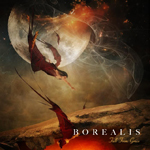 For fans of Evergrey who perhaps have been a bit disappointed with that bands direction on their last few albums, definitely give Borealis a try.